^ Daft Punk Musique Vol. 1 official website. DAFT PUNK.com. [2018-05-31]. （原始内容存档于2006-04-10）. ^ Perron, Erwan, and Gancel, Alice. Daft Punk, interview-fleuve pour la sortie de Random Access Memories. Telerama（英语：Telerama）. telerama.fr. 2013-04-07 [2013-04-07] （法语）. 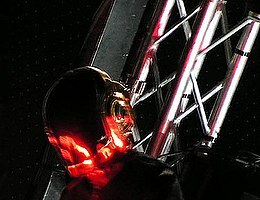 ^ Bas les casques – Le vrai visage de Daft Punk. parismatch. ^ Daft Punk interview in Japan (1/2) Retrieved on 2012-11-14. ^ Bryan Reesman, Daft Punk interview 互联网档案馆的存檔，存档日期2014-11-10. mixonline.com. Retrieved on 2007-03-06.